The following article originally appeared at MarketWatch on Friday 3/8/2013. Despite nervousness over new market highs, this rally appears to be in the early stages, not the end. With the market hitting new highs (DOW) or closing in (S&P 500), the topic du jour for the past couple of weeks, has been whether or not the rally can continue. In my last post, I noted that JNK, the SPDR High Yield bond index ETF, was dropping while the S&P 500 was continuing up. Since JNK and SPY have a high correlation (they tend to move in the same direction) something was due to give. 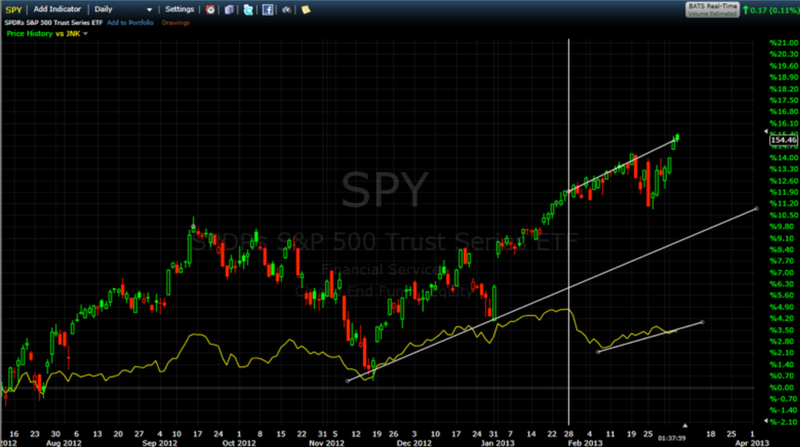 Either SPY was due a selloff, or the correction in JNK was done and it would soon follow SPY up. As shown in the chart below from freestockcharts.com, Spy (the red and green candle chart) has moved on to new highs since the downturn started in JNK, shown by the vertical white line. Spy did pause a bit to digest the sequester non-event, but it didn’t even drop to its support level, shown by the longer up sloping white line. And in fact JNK did resume a modest uptrend. The point being, SPY shrugged off two negative influences, a drop in high yield bond demand (lower price for JNK) and totally shrugged off the sequester. This leads me to my next market indicator to watch. It seems to me the market is still in phase #1, up on bad news, and hoping to get to #2, meaning news becomes consistently good. Not that all current news is bad by any means. In fact we’ve had some pretty good economic news lately. But when you include political events, news has been a mixed bag. And when confronted with bad news, the market is shrugging it off. Slow earnings growth? No problem, it will get better. Sequestration? No problem, it’s just politics. Italian election? No problem, the ECU will rein them in… And on really good news, good ISM report, the market is having really good days. 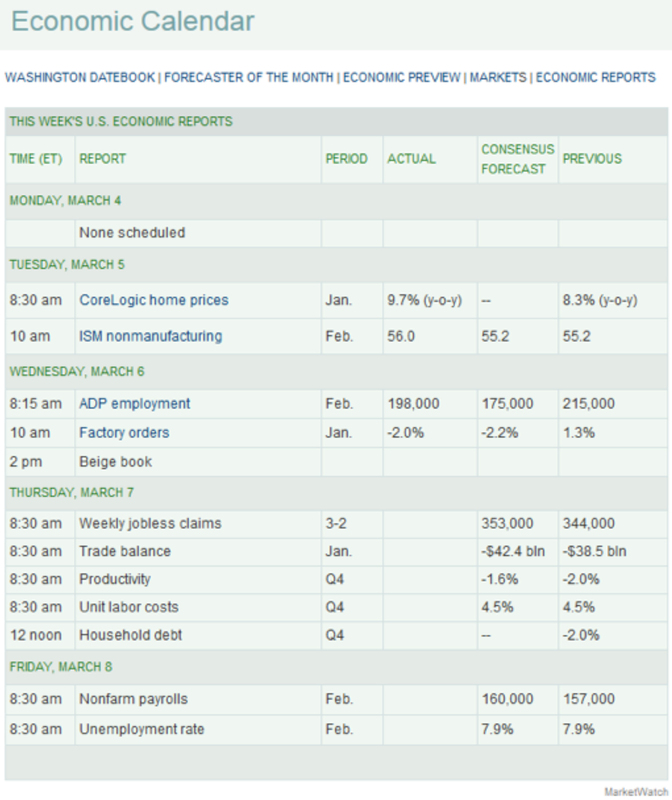 One easy way to follow the economic news is to use MarketWatch’s economic calendar. On a daily basis you can track economic reports and see the market’s reaction. I like to look at the data at the end of the week for a bigger picture of the data and market trend. This leaves the more subjective political news. My observation is that the market is shrugging off nearly everything political. Perhaps the first crack in our current rally will be when the market actually reacts negatively to what would seem to be negative political news. For now, my strategy is to stay bullish. While I personally can give a pretty ugly laundry list of reasons the market could (or should) go down, for now I’ll assume the market is smarter than I am, and not fight the trend.